It seems like every day a new product designed to enhance our lifestyles for the healthier and happier hits the shelves. Firmly believing that personal health and happiness are the recipe for doing good works, we want to share brands and the personalities behind them that bring goodness to the universe with passion and expertise. Just like you, each of us at Alive and Wellness Mag are always on the lookout for our own "Holy Grails" of health and wellness. We see a lot of products, but few have made it into our daily routines like the range of skincare, oral care and cleaning products from inVitamin. Therefore, we are very proud to share more this great brand in our first full-length feature. In 2011 InVitamin was founded in Minnesota by Dan Menk and Matt Beeler, veterans of the chemical industry, with one idea in mind. "The idea of creating an affordable truly natural personal care brand began with our own families," says Dan. "After finding many of the natural brands on store shelves to be 'pseudo-natural' and unfriendly to the average family's budget, we began looking for ways to break this barrier. What we discovered was a call for healthier, more sustainable choices with real ingredients that every family can afford." All inVitamin products are made in the United States, specifically by the good people of the Midwest. This was in efforts to closely monitor quality and provide costumers a truly reliable product that lacked any "unknowns." In the initial stages of business the company fully developed, concocted and packaged their products at one facility. Today, their growth has propelled the brand to partner with packaging companies. Remaining mindful of their small start, they choose to work with other small, family-owned businesses. In the end they are helping each other survive in a market ruled by large factory produced products, while also making their product more affordable to conscience consumers. When developing products, inVitamin looks for a way they can improve upon a product and its manufacturing process. The company does not just source its ingredients from nature, but also works to reduce it's impact upon the environment. One such product in development is a powdered mouthwash. "This product will help eliminate the waste that comes with shipping 99 percent water in your average liquid mouthwash," Dan notes. Although this particular product is not yet released, it is sure to be a hit, giving us more space in our grocer bags and cabinets while reducing waste. You can also count on it to deliver results! So, who exactly is coming up with their product ideas? Much of the all natural ingredients used in inVitamin's full-range of products have been trusted and proven effective for centuries. Since the USA is relatively young, the traditional use of natural ingredients is often traceable to other countries, places from which inVitamin sources its raw ingredients. "We've had the good fortune of forming some really incredible relationships with our suppliers and it has given us the chance to see some amazing sights across the world," shares Dan. These ingredients are then taken by their amazingly talented and creative formulator, Judy Shell, who then works away like a plant-loving mad scientist to develop the very best all natural products possible. As the world continues to be "Charcoal Crazed," the company's charcoal-based products have really taken flight. A bestseller is their Activated Charcoal Tooth Powder. Originally launched not as a response to the world's obsession with ripping "impurities" from their body, the powder was developed as a basic alternative to fluoride-based toothpaste and those on the market with toxic chemicals. We can attest to this product's ability to whiten our teeth and truly leave us with the freshest feeling mouth imaginable. An odd side-effect we encountered in using this product was that we became more mindful in our approach to dental care. Instead of just sleepily squeezing a glob of paste haphazardly on the brush and into our mouths, we got a certain delight in scooping out beautifully smelling minty soot onto our WooBambo brush, trying not to get it all over the place. It's then total hilarity as you discover what you look like with a black mouth. Some of us exhausted our supplies of guest/spare toothbrushes just to see the look on our visitors' faces trying charcoal dental care for the first time. The general consensus, once the shock of seeing yourself looking like a ghost pirate wore off, was that our teeth were whiter, brighter and cleaner. We were all left in a smiling, minty bliss. Much is to come from this growing brand. Not only are they growing their operations, meaningful partnerships and retail availability, but they will also be unveiling new products in 2018. In fact, inVitamin is about to make our active lifestyles less stinkier with a charcoal-based deodorant. "This is a really exciting product for us, as we've been working on the right formula for over a year. This will compliment the Coconut Oil Deodorant we added last year," says Dan. 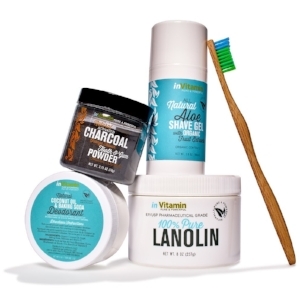 Parents can also rejoice as the company is about to unveil a new line of children's oral care products that are all 100 percent natural, plant based, and free from harmful and toxic chemicals. As a father, Dan truly sees the gaps in the marketplace geared towards children. He says, "I can attest to the need for something with fewer chemicals and toxins that my children will love. Brushing is a chore for kids (and their parents!) so our goal is to offer something plant-based and healthy they'll actually enjoy." He also adds, "We feel it's critical to pass this message on to our children so they learn the differences between standard vs natural and begin forming the right habits early." In many senses, inVitamin supports several great causes. As a certified cruelty-free brand they certainly value animal welfare. Their aim to reduce wasteful packaging shows a desire to reduce their carbon footprint and that of their loyal supporters. However, what really wows us is their commitment to using natural ingredients and the effectiveness of every single product. They proudly list the ingredients used on both their packaging and website unlike a lot of so called "natural" brands. Once you've experienced the effectiveness and quality of inVitamins full-range of skincare, oral care and cleaning products, you will be left in awe of what plant based products can truly achieve if passionate attention is at its roots.